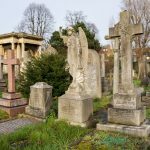 Over the past few weeks, we have been sharing cemeteries in Britain, Europe and the USA .This week we go local and show you some interesting Australian Cemeteries. Enjoy! Would you believe that there’s a suburb of Sydney with nearly a million inhabitants? 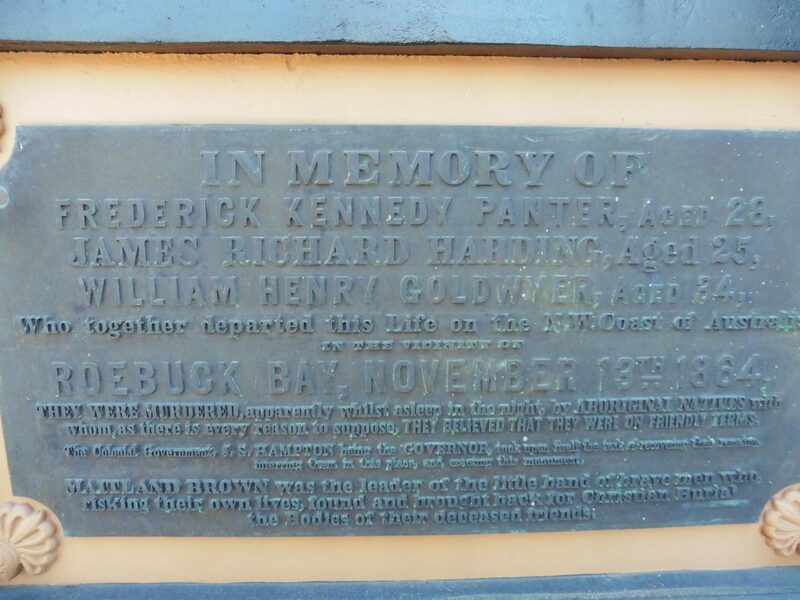 The only thing is, none of them are still alive, and the suburb is Rookwood, otherwise known as Rookwood Cemetery. Established in 1868, the cemetery holds two significant records, being both the largest Victorian-era cemetery still in operation and the largest necropolis in the Southern Hemisphere. It’s also the last resting place of many famous Australians, with everyone from politicians to business founders to the writer of “Advance Australia Fair” buried there. An excellent opportunity to explore it for the first time is during the Hidden Sculpture Walk. Held every September to October amongst the overgrown gardens and graves of the old Anglican section, the sculptures vary from the contemplative to the colourful. One of the world’s more scenic cemeteries! 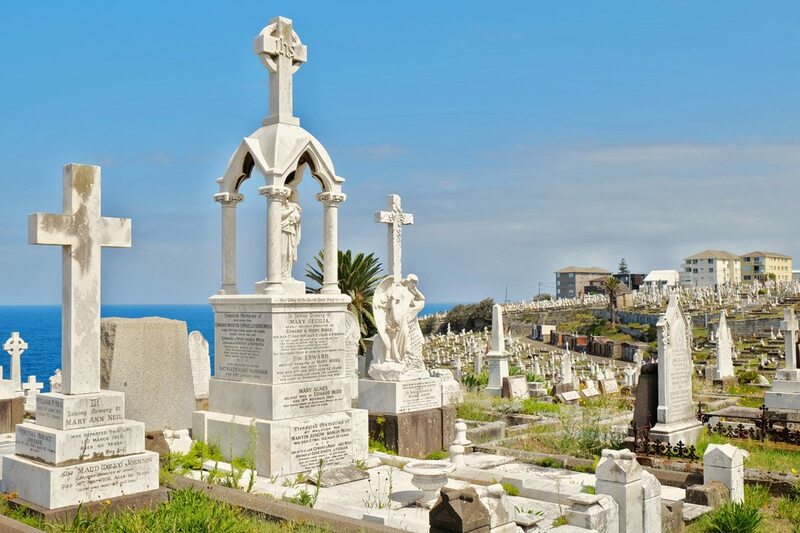 The Waverley Cemetery is a state heritage listed cemetery, which has been in operation since 1877. You can find graves of famous Australians here; such as Henry Lawson. The expanse of the white marble in contrast against the blue of the ocean is totally stunning! I’d never seen a graveyard as beautiful as this one! By the spelling of the name, you might think that Gegedzerick Cemetery was located somewhere in Europe. But in actual fact it is located just outside the small town of Berridale in the Snowy Mountains region of New South Wales. The name Gegedzerick is thought to be an Aboriginal name for the area. Some graves date back to the early 1840’s and many of them are my ancestors. In fact, I think it’s safe to say that I’m related in some way to about half the cemetery. 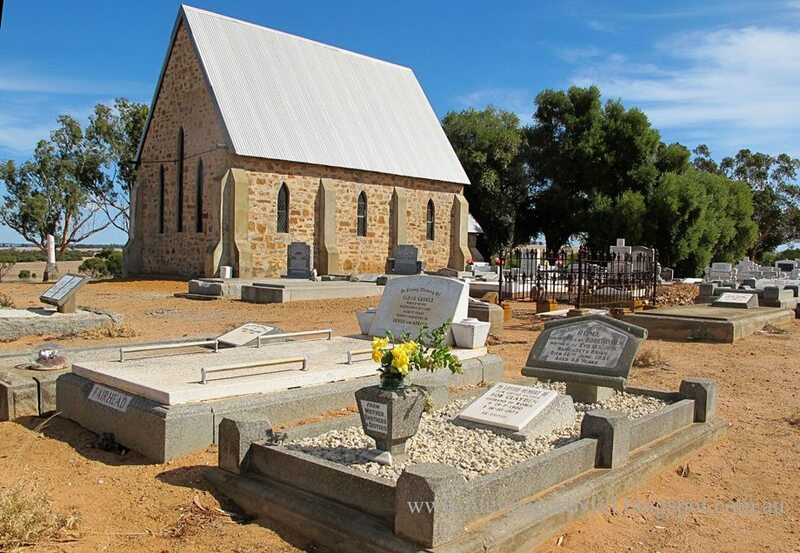 Within the grounds of the Gegedzerick Cemetery is a beautiful small church – St Mary the Virgin Anglican Church. It was built in 1860 it is still in use today. It features some wonderful stained glass and looks out over the valley below. The historic Farina ruins, in one of the driest regions on earth, come to life for 8 weeks every year. During winter, volunteers work the old bakery to raise funds for annual restoration projects, and the campground is awash with visitors heading north. But just out of town overlooking the distant wild ranges is the final resting place of many settlers who lived and died in Farina during its heyday. 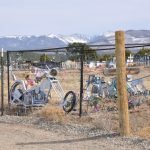 Although it’s hard to imagine a more bleak and lonely spot for a cemetery, the graves tell a story of the town’s fascinating cultural and social history; and its ethnic and religious diversity. Life wasn’t easy in Farina with lack of water and isolation ensuring the town’s decline and eventual ruin. Now that the bakery and campground ensure a steady stream of travellers to this remote South Australia spot the sacrifices and difficulties faced by its outback pioneers will not be forgotten. Kangaroo Island is Australia’s third largest island and lies in the state of South Australia. Rugged, isolated, and wild, Kangaroo Island is home to some of the friendliest people I’ve ever met anywhere in the world. The Cape Borda lighthouse was built in 1858 on the Island’s most western coast to guide ships travelling towards Port Adelaide. It was an isolated station with no roads connecting Cape Borda to the rest of Kangaroo Island. Every three months, lighthouse supplies were hauled up from ships from a nearby cove, Harvey’s Return. Harvey’s Return Cemetery is the final resting place of sixteen people who lived at the lighthouse. The earliest recorded burial was Captain Woodward on September 13, 1858. 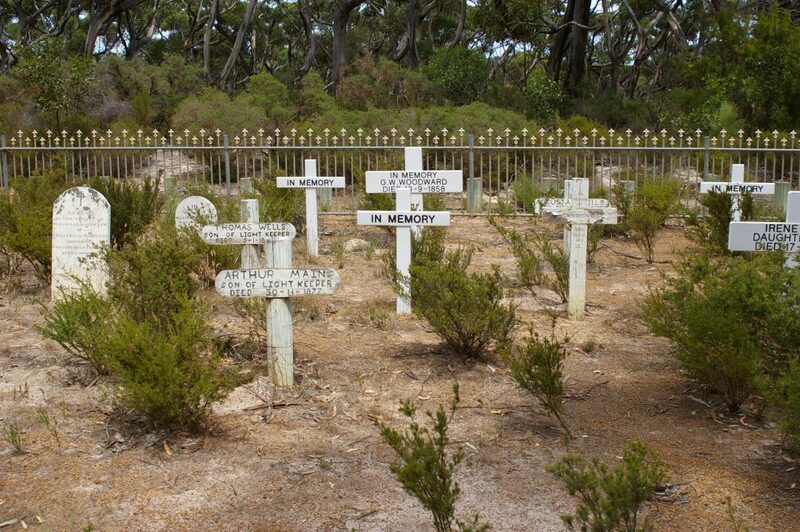 Cemeteries are fascinating places, and this small cemetery in bush scrub gave us a glimpse into the lives of the isolated few stationed at the Cape Borda Lighthouse. The deaths of babies, young children, and a woman, so far from medical help are a solemn reminder of how brutal life at an outpost could be. Walhalla is located 183 kilometers east of Melbourne in the foothills of the Great Dividing Range. Walhalla was at its peak from 1863 until 1914, Walhalla and its surrounding areas were one of the most prosperous gold areas in Australia. Walhalla and peaked with a population of over 3000 people. Walhalla supported 10 hotels,7 churches, several dance halls, a school with more than 500 students and over 30 shops. Life was hard in the colonial Australian goldfields. 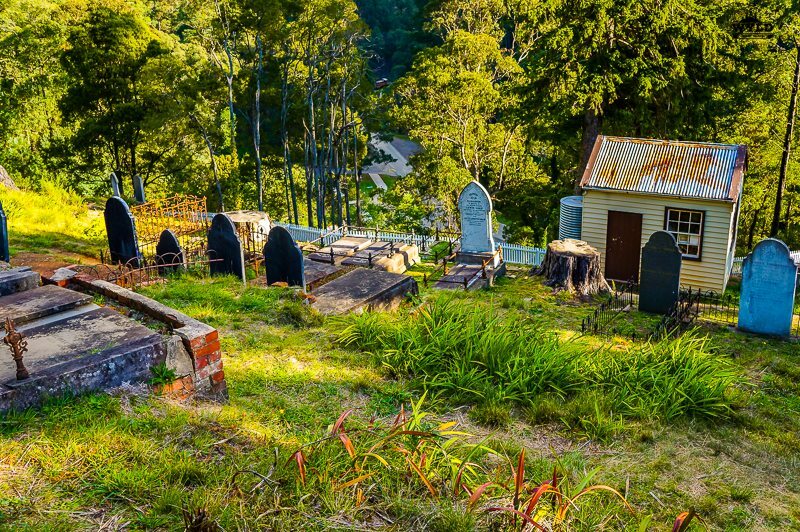 The Walhalla cemetery is located on a steep incline that rises up the side of the gully that the town is built in. 1100 Graves are located on the steep hill. 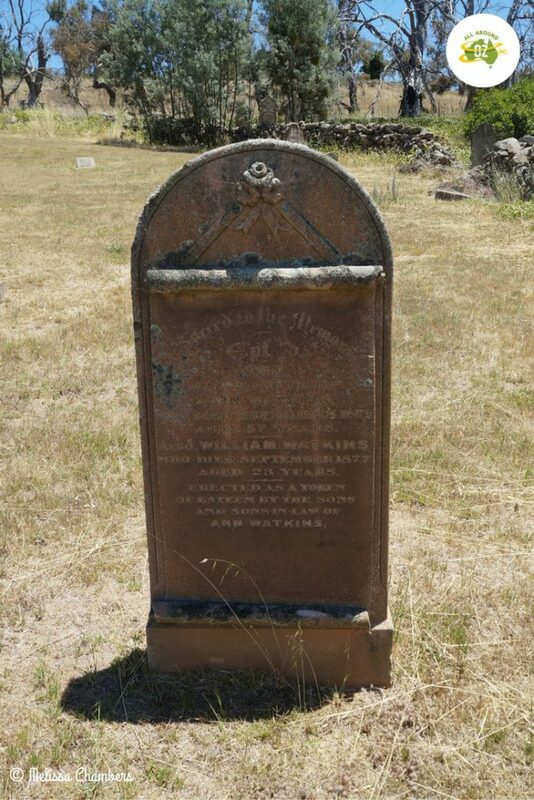 Some headstones still tell the story about life on the goldfields and the harsh reality that these pioneers lived in. 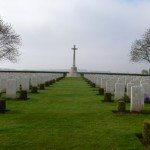 The majority of the graves present are pre-World War One which makes them historically significant. 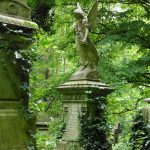 Ghosts yes Ghosts Walhalla is known for them and sightings in the cemetery have been reported over the years. 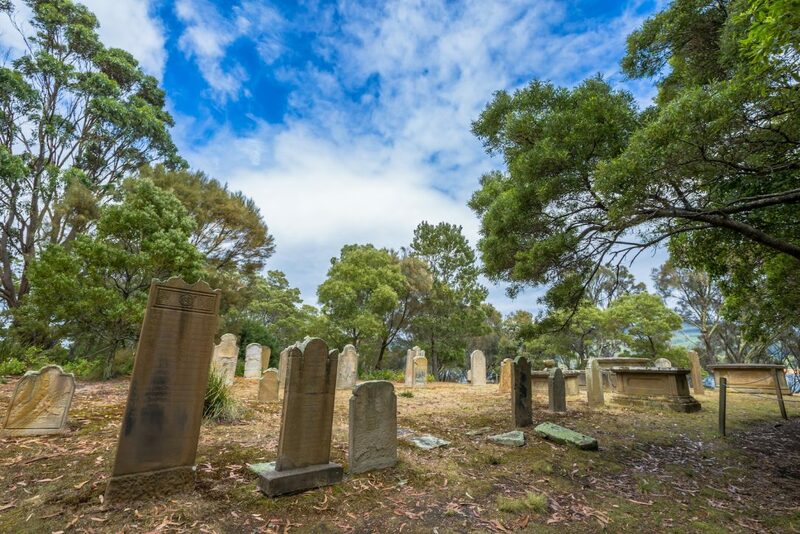 Australia has its fair share of historically significant cemeteries, particularly those dating from European settlement. One of the most significant is Isle of the Dead in Port Arthur, Tasmania. Port Arthur itself has a particularly strong historical significance in Australia, and Isle of the Dead is the where these early settlers and convicts of Port Arthur were buried. This included all persons from Port Arthur including soldiers, convicts and free settlers of the area. The only way to get to Isle of the Dead is by boat, and you’ll need to take a cruise from Port Arthur when you purchase entry into the prison. There are still many tombstones that remain intact, nearly all of which date back to the 1800’s. Taking a walk around is a fantastic experience as unlike many cemeteries that blend old with new, the island feels as though it’s been left in time. The St Patricks Anglican church in Mourambine sits on a small rise overlooking grain fields in Western Australia’s central wheatbelt. Built from local stone with she-oak shingles in 1873, services are still held here. In the church yard, which is dominated by two old olive trees, lie pioneers of the district, including my ancestor James Fairhead who came to Western Australia as a convict in 1853. The town of Mourambine which developed around 1860 has disappeared over the years – its fate sealed when the railway line came to nearby Pingelly in 1889. All that remains now is the church and its small cemetery, the rectory (now a farmer’s home), the old inn (also now a home) and the house where my father lived between 1939 and 1942. 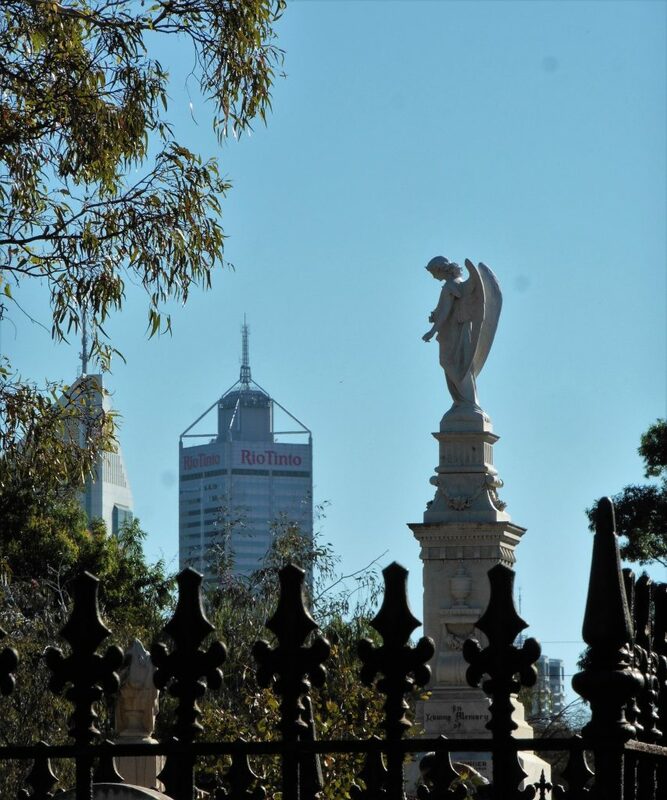 East Perth Cemetery is not only one of the oldest cemeteries in Perth but it will also give you amazing views over the city. Wandering through you will see many of the famous West Australian family names connected with the establishment of the colony. For me one of the most interesting was a memorial to three men who had died in northern Western Australia, the wording showed clearly how the population regarded Indigenous Australians and how they had no concept that they were taking the land from them. 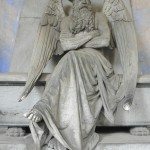 The cemetery is run by the National Trust and opening hours and special events can be found here. 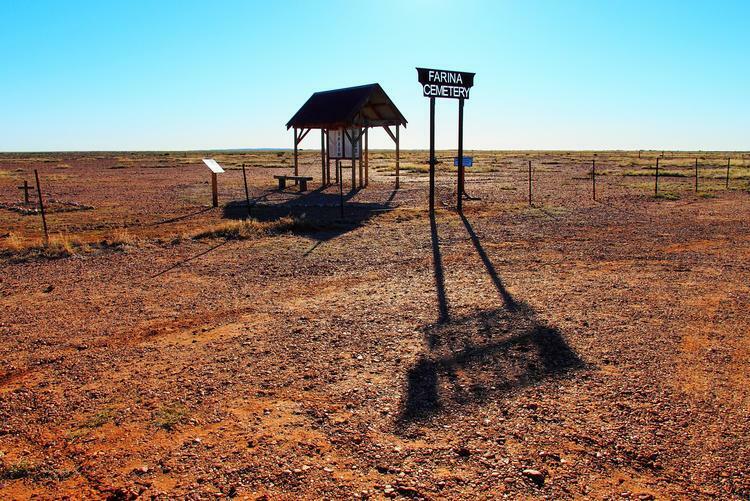 A one of a kind and a must visit place if in the area is Corrigin Dog Cemetery. 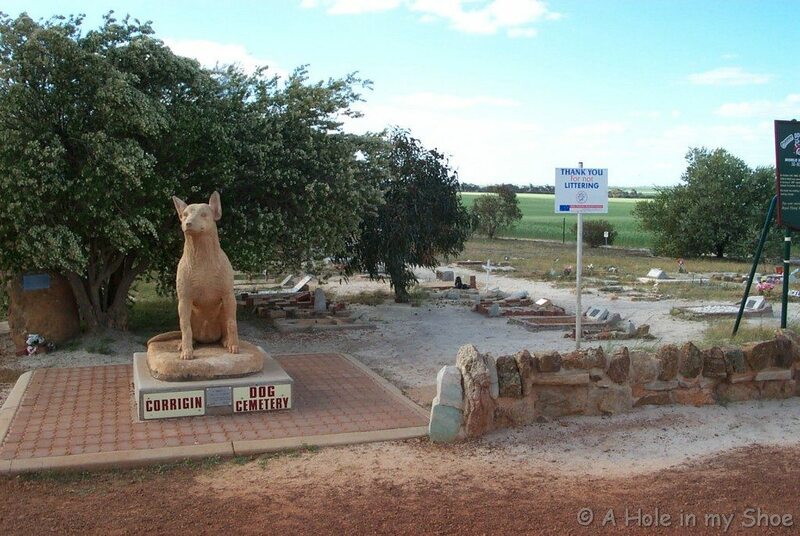 I was touched to find this place that pays the homage many a furry friend back in 2002 when I was driving through Corrigin, 230 kilometers east of Perth, Western Australia. Established in 1974 man’s best friend has a place to rest after a lifetime of dedication to their master. A large dog statue sits guard at the entrance of the final resting place and gravesites inscribed in tribute by families who have laid their beloved dogs to rest. When Strike, Paddy Wright’s faithful companion died he buried him where the cemetery is today as this was the softest ground he could find to bury Strike. Despite Corrigin only having a population of 903, today over 200 loved dogs are now buried at the Corrigin Dog Cemetery. 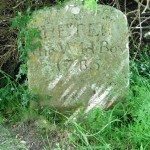 If you have any interesting cemeteries to add please get in touch. thank you for the opportunity to be a part of this post. There is so much history to be found within our cemeteries. 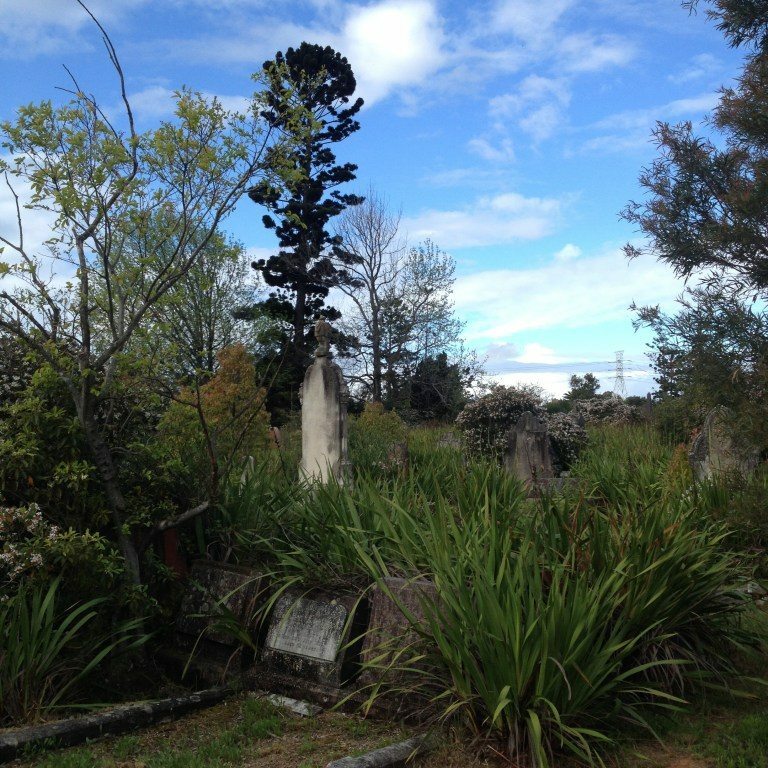 Who knew there were so many quirky and interesting cemeteries downunder??!! Thanks for including us in this post. Just wished I had taken more photos of some of the other amazing cemeteries I have seen. 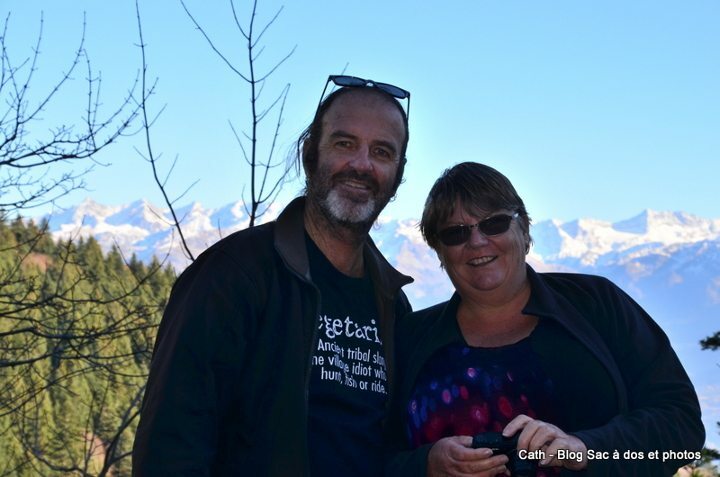 I know I m wishing I got to some that we found out about in Europe but there is always next time…. I really enjoyed this post! We’re always checking out cemeteries on our travels. My husband’s family is in the monument business, so he’s always interested in the types of headstones we use in Australia. I’m always scouting the history and funny quotes on headstones! Thanks for this – will be sharing with out readers via a schedule. 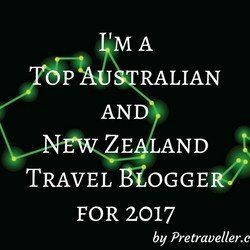 This post is really very interesting and historical.I am a traveler. I travel with my wife. I went there 3 years ago but I didn’t,t know this information. This information is very important for the next-generation traveler.Thank you so much for sharing this information.